Use these general and handwriting comments and phrases to ease the report card crunch. Easy to modify and tailor to individual students, and sure to help make the report card writing process faster and easier! Suitable for all grade levels. 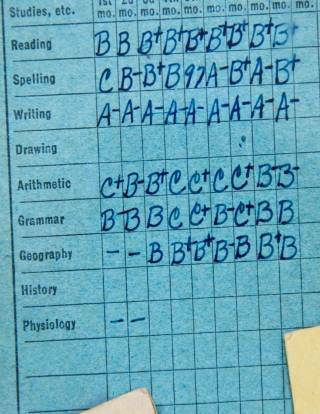 All of _______'s basic skills are at grade level, but he is not working to the best of his ability. _______'s school work has shown improvement over the past quarter. I hope this effort will continue. _______'s behavior continues to be inconsistent. She is still having difficulty following the school rules and respecting the other students. Please call to set up a conference. Thank-you for your continued support and help from home. The amount of extra time you have been spending with _______ on his schoolwork is evident. _______ has improved since the last time we met. I suggest that you continue to work on _______ nightly. _______ is a polite and alert _____ grader. Because he is a quiet boy, he needs to be encouraged to participate in class. Any help you can give from home would be very beneficial. _______ has adjusted nicely to her new school environment. Could you call to set up a meeting as soon as you are settled into your new home? _______ is gaining more self-confidence. _______ is maintaining grade-level expectations. _______ performs well in everything he undertakes. _______ is doing strong work in all areas. _______ is a clear thinker. _______ has good organization of thoughts. _______ should be encouraged to _____. _______ has failed to turn in makeup work. _______ is a good student who appears to be a deep thinker. _______ grasps new ideas promptly. _______ needs to spend more time on assigned tasks. _______ does not put enough time into the assignments. Please call to set up a conference. Your constant cooperation and help are appreciated. It is possible for _______ to exceed grade expectations. _______'s handwriting needs to be improved. _______ has good (poor) fine-motor skills. _______ is able to print on the lines. _______ spaces letters and words correctly. _______'s work is not neat. _______ does not form letters correctly. Some of _______'s printing is excellent, but it is often untidy in daily assignments. When printing, _______ often reverses letters, such as __, __, etc. More Report Card Comments and Phrases.